Building a successful brand in this day and age is no easy task, and at Brand Assembly, we hope that we can help alleviate the challenges that come with being an emerging designer! From our co-working spaces to our trade shows, creating a strong sense of community is important to us, and that's where our event series comes into play. 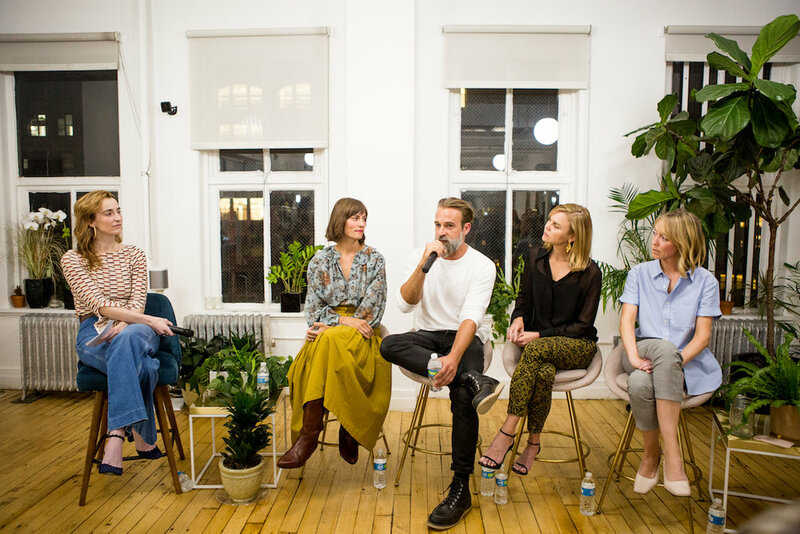 Over the last couple of years, we've tapped our network of some the most innovative business minds in fashion to participate in industry-wide discussions around networking, wellness in fashion, and much more. From coast to coast, these gatherings have strengthened relationships with designers and professionals in our community and have become an integral part of the Brand Assembly experience. Our most recent event took place at our New York Square on September 27th. 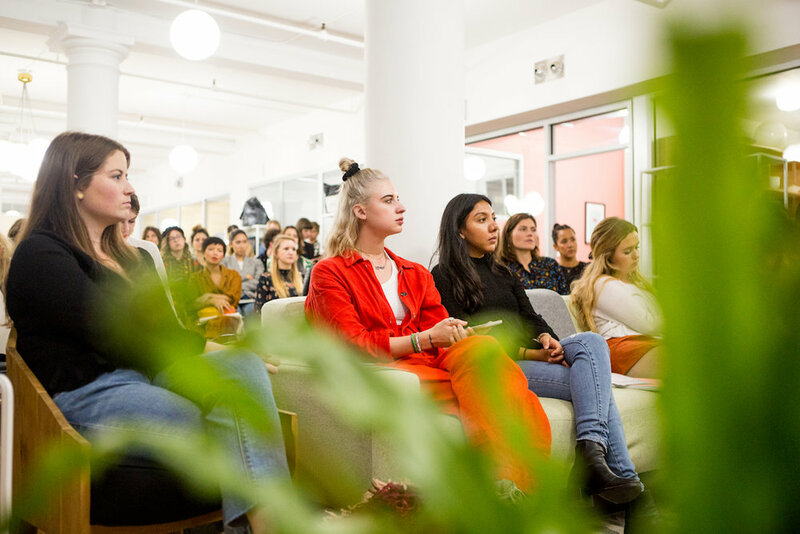 It focused on the business of branding in the form of a workshop and panel, and it engaged our community to think about the importance of branding in the digital age. The evening kicked off with a branding workshop led by Natalie Clark and Michaela McKenny of The Girls Creative. The duo walked us through a brief exercise that challenged one audience volunteer to describe their fictional brand by answering a few questions, and then have another volunteer assess the lifestyle, demographics, and price point of that brand based on their responses. It was an excellent warmup to get our audience thinking about brand perception and some of the basics that go into the initial stages of branding. When it comes to laying the foundation for your brand, our panelists unanimously agreed that having a brand book is key for setting your team up for success. Put simply; a brand book is a go-to framework that outlines your brand's fundamental traits — these can range from values and ethos to visual and aesthetic inspiration to copy and tone of voice guidelines. This living, breathing document is essential in keeping the team focused on the overarching brand mission. Amanda spoke more about this and mentioned that despite Club Monaco's size and recognition they have only just created a cohesive brand book. This proves that it's never too late to put these systems into place no matter where your brand is in its lifespan! Another big takeaway touched on the importance of branding in the social media landscape. Our panelists discussed the immense opportunity that social media presents in branding both your business and your personal brand. While Gretchen has a strong personal brand, she contends that it's not necessarily a priority for every designer but instead to focus on honing in on values, ethos, and intention. These traits can then be carried through brand content and storytelling, which is arguably just as important as the product itself. No matter what you're building, our panelists collectively agreed that having a great idea (and genuinely believing in it) is what leads to unforgettable brands. As an agency professional who works with brands from the early stages, Rebecca shared that she and her team look for businesses with potential, strong ideas, and what the problem is that they are trying to solve — all of which play a role in shaping the branding. When vetting potential clients, she also expressed the importance of simplicity and focus, which she believes come through brand values. It also doesn't hurt to be nice and find people (whether it be agency partners or investors) who share in those values too! Transparency, authenticity, and simplicity were heard commonly throughout the discussion. Ebenezer spoke more about this from an experiential marketing POV and reminded the group that branding for “Instagrammable” moments isn't the only thing to worry about! If anything, he believes that standing for something is the essence of what makes a brand in this day and age. And on that note, all of our panelists agree that if you're just starting off, remember to think about your purpose and what you believe in and let that be your guiding light as you develop your business. These are just a few memorable soundbites from the evening, and we hope you enjoyed highlights from this truly inspiring conversation. For more moments from the panel catch up with us on social media @brandassembly, and also be sure to follow along next week as we head to LA for our upcoming show and for our next panel featuring a discussion on building direct-to-consumer brands!